So cute! Love this DOLCE & GABBANA Boys Mini Me FIRENZE Sweatshirt & Bermuda Shorts from the Fall 2018 Collection. Inspired by the D&G Men’s TOUR D’ITALIE Collection, this boys luxury sweatshirt from Dolce & Gabbana has a wonderful illustrated print of Florence on the front and back. Complete the look with a pair of matching cotton jersey Firenze print Bermudas with a drawstring waistband and side pockets. 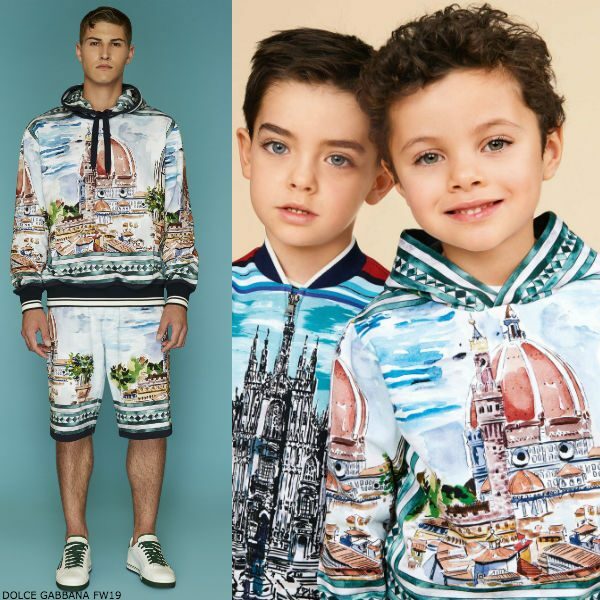 The perfect way to “discover a journey through the beauty of Italy.” Unfortunately, this DOLCE & GABBANA Boys Mini Me FIRENZE Sweatshirt & Bermuda Shorts is not currently available. You can shop similar Dolce & Gabbana Boys clothes from the current collection online.